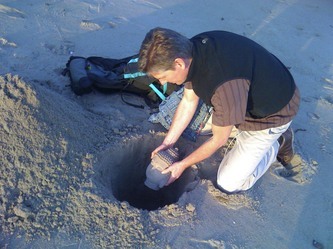 Digging a 2-3' deep hole at the waterline. Buried treasure to be discovered!
. . . Only 99 more to bury, from Mexico to Canada. 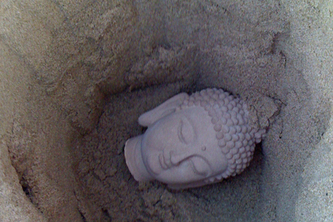 Since 2007 I have been making multiple cast-stone sculptures of Buddha heads and burying them on beaches along the Pacific coast of the US. 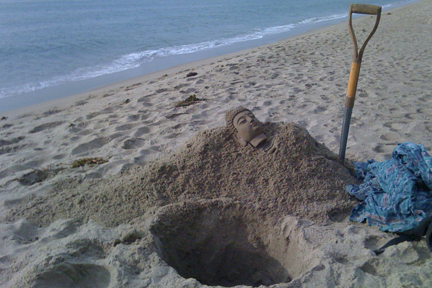 To date I have buried over 100 heads on public beaches from the Mexican border to the Canadian border. They are buried above high-tide line about 3 feet deep. I imagine that over time the shifting sands will uncover these heads and people will discover them, wonder what they are and take them home with them. I wonder if the experience will give them pause for thought and set their minds racing? It is also available as, and I have also shown this as, a mixed media gallery installation at the Sonoma Valley Museum of Art, with video, interpretive information, and a book of photographs. The beach installations create the opportunity for discovery and the chance to create some outside the box thinking, about culture, time and our place in the world. To bring the experience inside into a gallery setting I take the theme of historical interpretation a step further. Inside, I'm bringing 50 Buddha heads together with iconic symbols of different religious traditions and examining how we relate to the unknown. We naturally relate to the heads, as they're anthropomorphic; and that would be the case if they were Hindu, Christian, Aztec, etc. But we read the religious symbols on a different level; they are more abstract and foreign to us. Because they are symbols, we process them on a different level; one that's more abstract, removed and involves intellect. I'm asking how we can approach the unknown--the "other"--calmly, without fear or anger. I'm tying the two together with an temporary sand mandala made up of geometric symbols, which are the building blocks of rational, mathematical thinking and nested in a way that is typical of sacred geometry. I'm asking the rational/natural to mediate between the heads and the symbols. 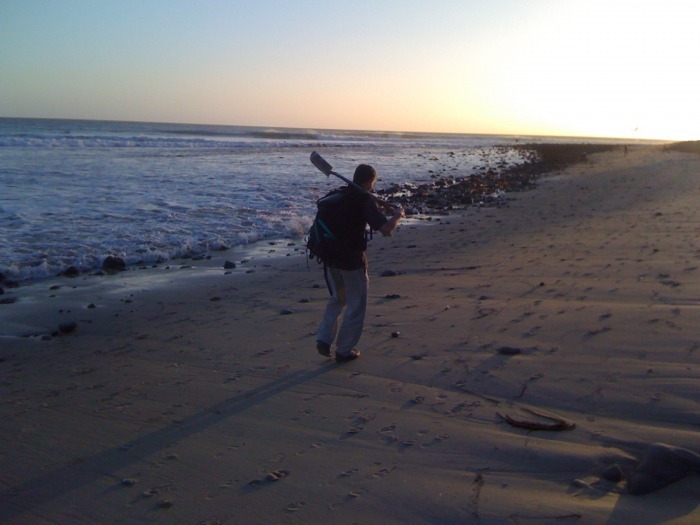 While I can't bring the natural world inside, I can use the language of the natural world, that "shadow of reality", as a field for reconciling some challenging dialogue.